Early Bird: $320 plus HST before May 5th, 2019. *Beyond Yoga Teachers and Beyond 200HR YTT students receive an additional $20 off of the registration fee. Join us for our 18 hour weekend intensive Gentle Yoga For Active Aging Teacher Training. This course runs Friday night from 5-9 p.m. and Saturday and Sunday from 9-5 p.m.
Friday, May 24th – 5:00 p.m. – 9:00 p.m.
Saturday, May 25th – 9:00 a.m. – 5:00 p.m. Beyond Yoga Teachers and Beyond 200HR YTT students receive an additional $20 off. million) than children (5.8 million) in Canada. There are great benefits in a Gentle Yoga practice for Active Aging practice. In addition to being safe and adaptable, these practices are also effective in keeping the mind and body in good health. This ’18-hour Intensive’ will provide you with the knowledge and tools to help you create safe, accessible and appropriate Gentle Yoga classes for active aging. You will be given insight into the aging process and its impact on the body so that you can provide adaptations as needed. The Intensive will cover the chronic health concerns of older adults and what it means to you as an instructor. You will be able to focus on creating a Gentle Yoga practice that allows for continued functionality, strength and independence which can be transferred to Activities of Daily Living (ADL’s). 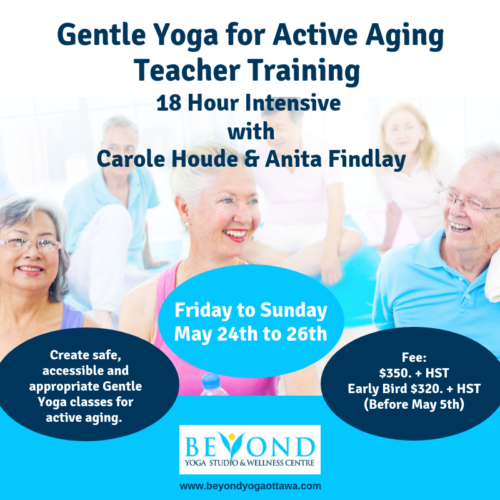 Who will Benefit from Gentle Yoga for Active Aging Teacher Training? Yoga Teachers, teachers in training, students and anyone wanting to deepen their knowledge in this area, refine their teaching skills and learn more about the benefits of yoga for an active aging population. 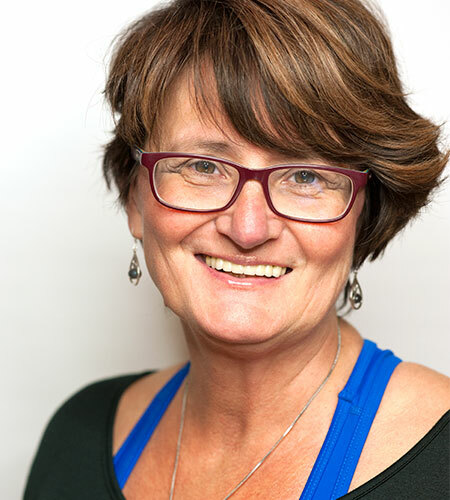 Carole Houde is the Program Manager at Beyond Yoga Studio and Wellness Centre. She has over 30 years of experience in health and wellness and is a E-RYT 500 Yoga Teacher. She is also a Yoga Tune Up®, Yin, Pilates and Barre Method® teacher, Personal Trainer and Nutrition Counsellor and is part of the Beyond Yoga YTT200 Teacher Training Team. She has also completed training with Heart Wise from the Ottawa Heart Institute, Seniors Fitness Instructor Course with Canadian Centre for Activity and Aging at University of Western Ontario and Can Fit Pro’s Active Aging Certificate. She has recently created two new thriving Programs at Beyond: Forever Young Yoga and Forever Strong which are both based cornerstone programs at the studio for Active Aging. Anita Findlay began as a Group Fitness Instructor and, over the past 20 years in the fitness industry, has expanded her certifications to include yoga from the Maureen Rae Yoga Studio, Pilates from East To West Yoga and Pilates, Barre, Drums Alive and The Groove Method as well as Senior Fitness Instructor from the Canadian Center for Activity and Aging (CCAA) through the University of Western Ontario. Presently Anita works full-time as a Fitness Program Coordinator for the City of Ottawa at the Churchill Seniors Recreation Center. Anita is also a trainer for CCAA, teaching the SFIC courses and other workshops for instructing older adults. A University of Ottawa graduate, Anita now works with the U of O Heart Institute as the trainer for the Heart Wise Exercise program. Over the years Anita has gained insight and knowledge into the aging process and the impact exercise can have on maintaining an independent and active life. 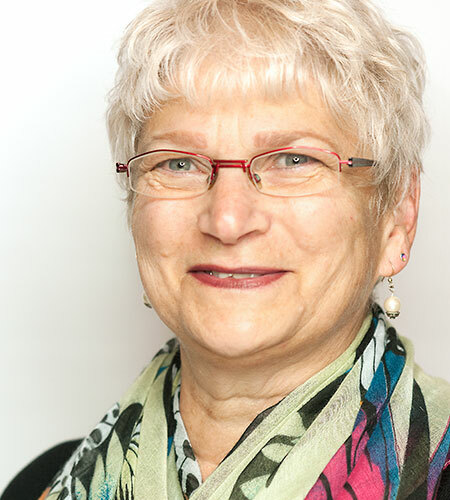 Anita successfully developed a program specific for clients with knee and hip replacements and continues to work to adapt programs like the BarreFit for the older adult population and offers osteo-safe Pilates. For more information please contact Carole Houde at: choude@beyondyogaottawa.com or call the studio at 613-591-9642 extension 507.